Attorney General Bob Ferguson was right to challenge a far-reaching federal ruling that forces Washington state to spend nearly $2 billion replacing culverts. Much more than culverts is at stake. 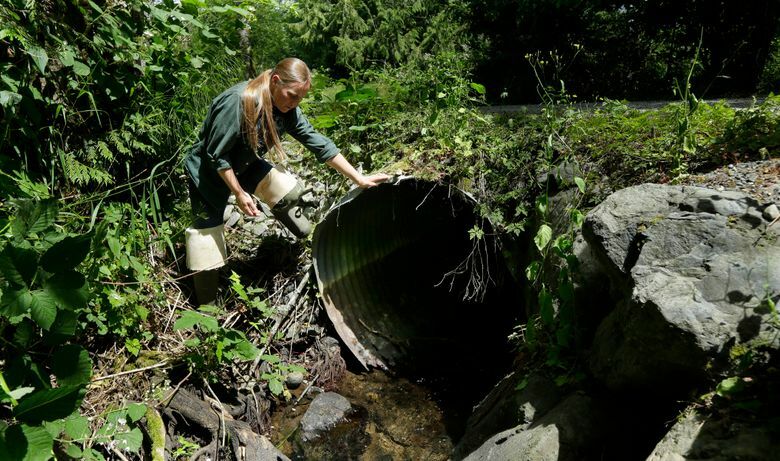 IN a lawsuit with huge implications for Washington, Attorney General Bob Ferguson rightly asks the U.S. Supreme Court to consider whether the state must spend billions on fish culverts. The culvert work was upheld by the Ninth U.S. Circuit Court of Appeals. It directs the state to promptly remove and upgrade nearly 1,000 culverts at an estimated cost of $1.8 billion. Supreme Court review must clarify questions raised by the ruling, including the extent of tribal authority on nontribal land. Of course, culverts, which enable fish to safely travel in streams passing underneath roadways, should be improved for habitat recovery. Washington has been upgrading culverts since the 1990s. But the state should not waste a fortune replacing culverts on streams that don’t support fish, because they are blocked by other obstructions. There are other absurd elements in the ruling. The culverts in question were built mostly with federal money, following federal standards. Yet in 2001, the feds, allied with tribes, blamed the state for bad culverts and sued for their removal and replacement. Really, the feds should fix culverts they had the state install to faulty standards. More important is the legal precedent that will be set if the ruling stands. It would establish new tribal authority: If tribes can demand culvert removal on nontribal land, they could follow up with lawsuits demanding the removal of dams or cessation of farming and development activities. “The goal of the tribes from the beginning in this case is to establish the principle that because land-use and development decisions affect the waters of this state, where salmon are present, that they should in a sense be co-managers of the lands and waters of our state,” former Attorney General Rob McKenna, who handled the case for eight years, said in an interview. McKenna believes that’s why tribes rejected settlement offers. The state offered to accelerate its culvert replacement. Federal and state government mistreated tribes in the past. But judges cannot rewrite that dark chapter in our history or modify the 1855 treaty at issue in the culvert case. Yet the culvert ruling declares a “massive new right and obligation” and “entirely ignored” the treaty agreement in which the tribes ceded authority over nontribal land. The ruling in effect finds that tribes “silently retained a right to control land use decisions and state policies in the ceded territory that could affect salmon,” Ferguson argued. Tribes are already leaning this way. At their request, Democratic lawmakers during negotiations in the last Legislature tried to give tribes veto power over land-use decisions, on nontribal lands, involving water supplies and streams. This is a key reason why lawmakers gridlocked over water rights, spurred by a separate case known as Hirst. Tribes are a major political force. With casinos generating billions of dollars a year, they generously support election campaigns. That influence, combined with modern sensibilities and Washington’s shared interest in fisheries, have made state officials very supportive of tribal efforts to restore salmon habitat. Yet the Ninth Circuit ruling insinuates that Washington’s opposition to the culvert order is an extension of discriminatory behavior in the previous century, akin to violent clashes in the 1960s over fishing grounds and tribal fishing restrictions in the 1920s. If true, the court would be justified bringing the hammer down. But it’s false and ignores recent history. In recent decades, the state spent hundreds of millions on fish-friendly culverts and habitat restoration. Continued investment is needed, but it should be pragmatic and dictated by research, not disruptive lawsuits and politics. Questioning the culvert ruling is not anti-environment. It’s common sense. Ferguson is an ambitious Democrat. So his decision to seek review of these important issues, despite blowback from his party and tribes, is brave and commendable. Editorial board members are editorial page editor Kate Riley, Frank A. Blethen, Donna Gordon Blankinship, Brier Dudley, Mark Higgins, Jonathan Martin, William K. Blethen (emeritus) and Robert C. Blethen (emeritus).